At exit 16, (Route 896), Pine Ridge Road, head West to Goodlette-Frank Road, turn left, heading South to Central Avenue. Turn right, cross over US41, to Third St. South, turn left and continue to the shopping and historic district. 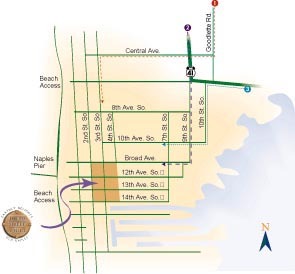 Head South on US 41 (9th Street) at downtown Naples continue South through the intersection following the historic district signs. Proceed to Broad Ave. and turn right which will lead to the shopping district. Follow US 41 west to 10th St. South, turn left and follow to 10th Ave. South, turn right, continue to Third St. South and turn left to the shopping and historic district.